How to create faux shiplap fast and cheap! Here is a step by step tutorial of how I transformed these plain white walls to an authentic looking faux shiplap. First the walls were already painted white so that is something you would need to do first. Keep in mind that the walls don't need to be perfect. I have real shiplap in my home and it's not perfect. The gaps between the boards are not uniform in width. There are knot holes and nail holes that all add to the charm. So don't sweat getting a perfectly smooth wall to start this project. Be sure the walls are dry before beginning. A metal yard stick (or very straight yd. stick), two black sharpies, painter's tape or a helper. You first want to be sure you start on a level line. You can start at the top of the wall or bottom. I started at the top because I knew it was going to be the most visible part of the project. Make use your ceiling is level (use a level tool to double check) If there is a sloop, you may want to adjust the first line to make it level. If the first line isn't level , it will become more and more apparent the further down the wall you go. Once your have the first line marked, you can begin measuring the wall. I used a pencil and starting from the top, measured down every 8 Inches. I wanted 8" boards, if you want smaller or larger boards adjust accordingly. Then moving horizontally approx. every 12 inches, start at the top again and use your pencil to mark every 8 inches down the wall. Repeat until you have marked the entire wall. Once all the marks are in place, you want to lay your yard stick level with the marks and using a black sharpie, draw a line against the yard stick, covering over the marks you've made. I used painters tape to hold the yard stick in place. If two people were working together to hold the yd. stick, the tape wouldn't be necessary. I put three pieces of tape on the stick and only had to replace once during the whole project. I would just pull the tape down enough to allow the marker to pass by on the stick. Once all the horizontal lines are drawn, I drew vertical lines randomly, to represent the connection between two boards. I also randomly made some tiny dot marks to represent nails. I also drew a line in the corner's because my "real" shiplap has a trim piece in the corners. I would personally attempt this technique in a small bath or hallway without hesitation. I love how authentic this looks. During a recent snow, I decided to update my filing system and needed something that would work well in my farmhouse. After searching our storage building, I found an old filing cabinet and a silverware storage box. Here's what the file cabinet looked like before. The silverware box was just plain brown wood. I had some sofa feet that I'd picked up some time ago at our Habitat Restore and some leftover drawer pulls from previous makeovers. 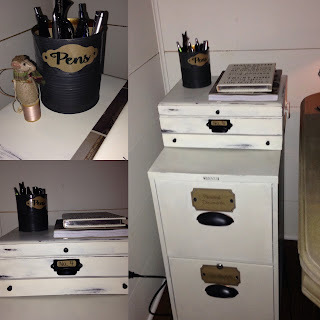 I used Annie Sloan Old White Chalk Paint to paint the filing cabinet and storage box. I painted the feet with graphite chalk paint. I also didn't like the original drawer pull space on the filing cabinet and my drawer pulls didn't cover the space. I decided to print a label with my Silhouette Cameo on heavy card stock to place over the original pull area. Then I attached the new pulls just below and they work perfectly. The silverware box sits perfectly on top and I feel gives the piece more character. I also painted a tin can with the graphite chalk paint and added a label to store pens. I placed 4 toilet paper rolls inside the tin can to organize the pens. Since I used Kraft paper labels, the toilet paper rolls didn't need to be painted or covered to match. Love how it all turned out. The finished project really added warmth to my desk area.